The HACKZALL M18 Cordless LITHIUM-ION One- Handed Recip Saw (2625-20) features a Patent Pending Dual Gear Anti-Vibration System for unmatched comfort and control as well as light weight design for superior control and versatility. The powerful motor delivers 0-3,000 strokes per minute and a 3/4 inch stroke length allows for fast cutting through a wide range of material such as wood, metal and PVC. The dual gear anti-vibration system increases control and accuracy.The 2625-21CT also features a QUIK-LOK blade clamp which offers fast and easy blade changes. The DCS367B 20-Volt MAX XR COMPACT Reciprocating Saw is a lightweight, compact saw designed to make cutting in between studs and in other tight spots easier than with traditional reciprocating saws. The brushless motor helps to provide up to 2.5x more run time to get the job done. With a 1-1/8 inch stroke length and a variable speed trigger delivering up to 2,900 strokes per minute, this saw is fast and efficient. It also features a keyless, lever-action 4-position blade clamp for quick and easy blade changes in four directions for a variety of applications including flush cutting. A bright LED light is included to illuminate dark work areas. Tool only batteries sold separately. The M12 FUEL HACKZALL is the fastest cutting and most powerful saw in its class, delivering over 4X more run-time, up to 70% faster cutting, and up to 6X longer tool life than competitive saws. The compact, one-handed design provides superior control and the ability to make cuts in tight spaces. Its light weight design is optimal for overhead cutting applications. The POWERSTATE Brushless Motor outperforms all leading competitors with constant power output, yet runs cooler with no wearable components. REDLINK PLUS Intelligence ensures optimized performance and protects your investment from overload, overheating, and over-discharge. The M12 REDLITHIUM XC4.0 Battery Pack (not included) provides more work per charge and more work over the life of the pack than competitive batteries. The dual gear counter balance mechanism significantly reduces vibration, providing faster starts in metal and reduced user fatigue. The M18 SAWZALL Reciprocating Saw delivers exceptional durability, speed and run time. The all-metal gearing and REDLINK Intelligence provide ultimate performance and protection against job site conditions. The M18 SAWZALL Reciprocating Saw provides up to 30% faster cutting and 50% more run time in key applications versus leading competitors. The slim front-end design provides improved ergonomics, offering maximum comfort and control. M18 18-Volt Lithium-Ion Cordless Hackzall Reciprocating Saw Kit with 1.5Ah Battery, Charger & Tool Bag The HACKZALL M18 Cordless LITHIUM-ION One- Handed Recip Saw (2625-20) features a Patent Pending Dual Gear Anti-Vibration System for unmatched comfort and control as well as light weight design for superior control and versatility. The powerful motor delivers 0-3,000 strokes per minute and a 3/4 inch stroke length allows for fast cutting through a wide range of material such as wood, metal and PVC. The dual gear anti-vibration system increases control and accuracy.The 2625-21CT also features a QUIK-LOK blade clamp which offers fast and easy blade changes. 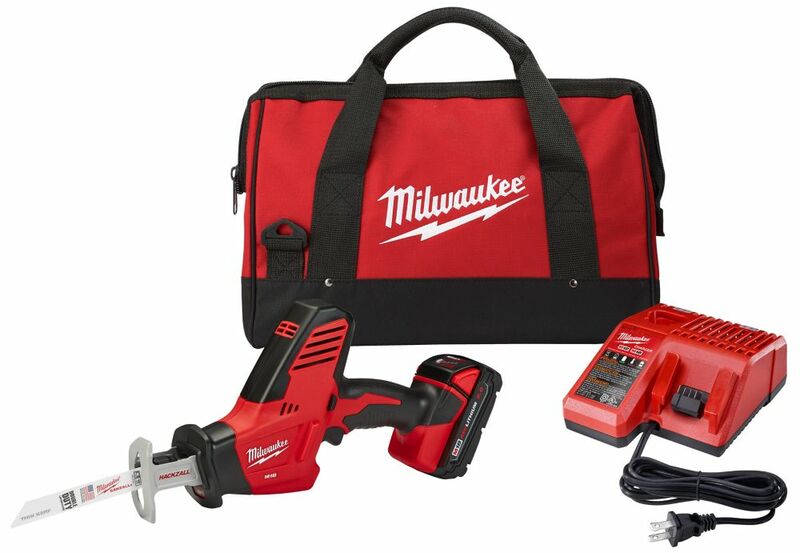 M18 18-Volt Lithium-Ion Cordless Hackzall Reciprocating Saw Kit with 1.5Ah Battery, Charger & Tool Bag is rated 4.7 out of 5 by 25. Rated 4 out of 5 by ThayerP from The reason I purchased was its size and versatility. Far exceeded expectations. The reason I purchased was its size and versatility. Far exceeded expectations. Rated 5 out of 5 by gardenchick from Love this tool. I'm 70 and have arthritis in my hands and with this tool, I am able to trim my t... Love this tool. I'm 70 and have arthritis in my hands and with this tool, I am able to trim my tree branches with ease. My son had one he loaned me and I think I've probably almost worn it out so decided to buy one of my own. I can usually do my trimming without having to recharge and that's a plus for me. Rated 5 out of 5 by NVKnifeguy from Great saw,really like it. Handle is great, cuts well.... Great saw,really like it. Handle is great, cuts well. Ordered online ship to store. When I got to the store, the kit with the large (5ah) battery was selling for just $20 more. Sent the saw back and bought the kit in the store with the larger battery. Wasn't available when I bought online. Rated 5 out of 5 by John from This is the second unit I purchased love it, 1st... This is the second unit I purchased love it, 1st one was an m12. Very happy with all my Milwaukee tool's. Rated 5 out of 5 by HomeDepotCustomer from Works great very powerful and easy to hold.... Works great very powerful and easy to hold.